Trence "Tre" Mason (born August 6, 1993) is an American football running back for the Los Angeles Rams of the National Football League (NFL). He was drafted by the Rams in the third round of the 2014 NFL Draft. He played college football at Auburn. Mason attended Park Vista Community High School in Lake Worth, Florida, where he was a standout football and basketball player, and also ran track. He rushed for 1,643 yards and 24 touchdowns as a senior in 2011, and was named the 2009 Palm Beach Large School Offensive Player of the Year and First-Team All-Palm Beach County by the Sun-Sentinel. He was also on the school's track & field team, where he competed as a sprinter and jumper. He placed 7th in the 100 meters at the 2009 Park Vista Meet, with a time of 10.9 seconds. At the 2010 Palm Beach County Championship, he earned a sixth-place finish in the long jump event, recording a career-best jump of 6.63 meters. He also competed in high jump, he got a top-jump of 1.88 meters at the 2011 Warrior Invitational. Considered a four-star recruit by Rivals.com, he was rated the 14th best running back in his class. He committed to Auburn over offers from West Virginia and Mississippi. In his first college game, Auburn against Utah State, Tre Mason returned a kick-off 97 yards for a touchdown. In the 2013 SEC Championship Game against Missouri, Mason set an SEC Championship rushing record with 304 yards (breaking LSU's Justin Vincent's previous 2003 record of 201 yards), touchdown record with four touchdowns, rushing attempts record with 46 carries and was named the game's most valuable player. As a junior in 2013, Mason was a first-team All-Southeastern Conference (SEC) selection. He was named one of the six finalists for the 2013 Heisman Trophy. In the 2014 BCS National Championship Game, Mason rushed for 195 yards on 34 carries and a touchdown in a 34–31 defeat by the Florida State Seminoles. He finished his season with 1,816 rushing yards, breaking the school record held by Heisman winner Bo Jackson's 1,786 set in 1985. It was also the third-highest rushing yards total in a single season in SEC history, behind only Herschel Walker (1,891 yards in 1981) and Darren McFadden (1,830 yards in 2007). Later single-season yardage marks set by Alabama's Derrick Henry (2,219 yards), and LSU's Leonard Fournette (1,953 yards) placed Mason's 2013 performance at fifth-highest all time. Mason announced on January 9, 2014 that he would forgo his remaining eligibility and enter the NFL Draft. He was drafted by the St. Louis Rams in the third round (75th overall) of the 2014 NFL Draft. 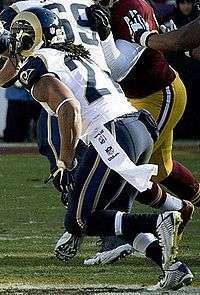 Mason was the Ram's third pick in the draft, behind former team mate and second overall pick, Greg Robinson. In Week 7, 2015 in a game against Seattle, Mason ran for 85 yards on 18 carries with 1 touchdown in a St. Louis win. In Week 11, he had 113 yards on 29 carries in a game against Denver. During a Week 13 matchup against Oakland, Mason ran for 117 yards on 14 carries and 2 touchdowns, to go along with one receiving touchdown. Following the 2015 season and going into the 2016 season, it was reported that Mason had not been in contact with coaches or players from the Rams since the end of the season. Coach Jeff Fisher stated "I tried numerous times to reach him, he has made a decision not to communicate with us, not to talk. Not talking to his teammates. Right now we're more concerned about his well-being than we are his football career." Mason had several run-ins with the law and displayed erratic behavior throughout the summer. On July 30, the Rams placed Mason on the reserve/did not report list. After Mason led police on a high-speed ATV chase, Mason's mother stated that Mason had the "mindset of a 10-year-old" due to head injuries sustained during his career. In November, Mason pleaded no contest to charges related to the ATV chase. His father, Vincent Mason, is a member of hip hop group De La Soul. ↑ "Park Vista Meet - Complete Results (Raw)". Fl.milesplit.com. 2009-03-17. Retrieved 2016-08-26. ↑ "Palm Beach County Championship - Complete Results (Raw)". Fl.milesplit.com. 2010-03-25. Retrieved 2016-08-26. ↑ "Warrior Invitational - Complete Results (Raw)". Fl.milesplit.com. 2011-03-04. Retrieved 2016-08-26. ↑ "Rivals.com". Rivals.yahoo.com. Retrieved 2016-08-26. 1 2 Goldberg, Charles (September 12, 2013). "'He's in the rhythm': Auburn's Tre Mason knows the way". Auburn Football. AuburnTigers.com. Retrieved December 7, 2013. ↑ "Missouri vs. Auburn - Game Recap - December 7, 2013 - ESPN". Scores.espn.go.com. 2013-12-08. Retrieved 2016-08-26. ↑ "Southeastern Conference Single Season Leaders and Records for Rushing Yards | College Football at". Sports-reference.com. Retrieved 2016-08-26. ↑ Nolan Nawrocki (2013-02-13). "NFL Events: Combine Player Profiles - Tre Mason". Nfl.com. Retrieved 2016-08-26.